Haroon K. Ullah, PhD, a social media authority in the Mideast, will present on how social media has dominated the discourse of recent events in the Muslim world – from the “Arab Spring” to ISIS’s online recruitment and the recent deadly attack in Manhattan. He will discuss the roles of social media in these events will identify key trends across the Muslim world that can teach us about regional and international politics and diplomacy. A former senior advisor to three U.S. 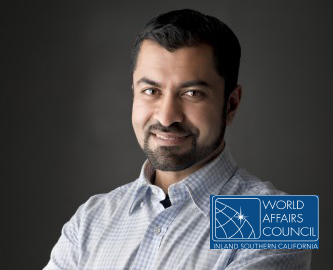 Secretaries of State, with a special portfolio on digital transmedia strategy and countering violent extremism, Ullah is an award-winning author, a Peabody TV Award recipient, an adjunct professor at Georgetown University, and a term member of the Council on Foreign Relations. The event will be held at 5:30 p.m., Wednesday, August 29, in room 3111 at the Centennial Complex, 24760 Stewart St., Loma Linda. The event includes both a reception and presentation, admission to both is free for students with ID. The cost is $20 for World Affairs Council members who preregister and $25 for non-members who preregister. The general admission door price will be $30, space permitting. Register or learn more, or call 909-558-7446, or email kyutuc@llu.edu.